Sue Tienor isn’t your typical retired registered nurse. As a member of Newman Catholic Parish in Eau Claire, Tienor leads a very active life. Sue serves cookies during the annual Mardi Gras Pack the Pantry Party. 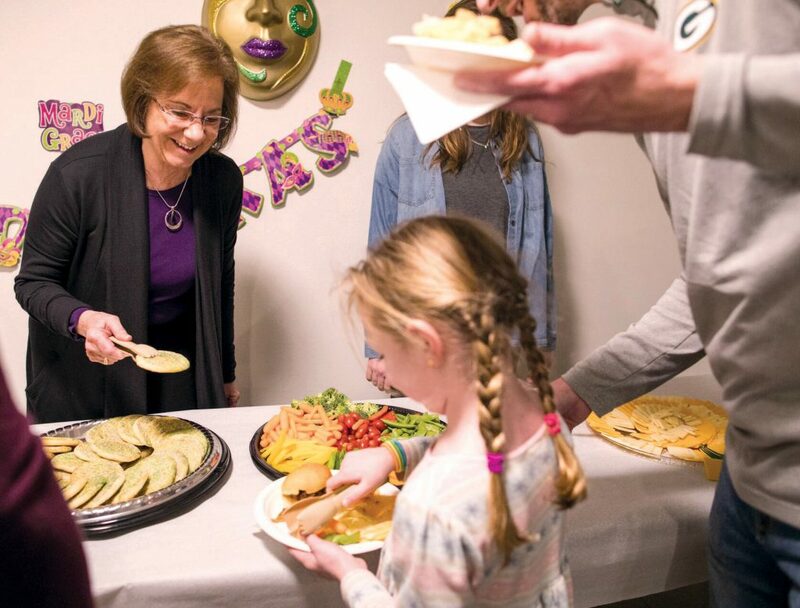 Parishioners enjoy a meal and socialize, along with kids’ activities, after the Saturday evening Mass before Lent begins. Donations go to UWEC Campus Harvest, CVTC and St. Francis food banks. Born in Gillette, Wisc., she, along with four brothers, grew up in a faith-filled family. Living across the street from the Catholic church made it convenient for parish involvement to begin at a young age. Her father was one of the finance officers of the parish and her brothers were altar boys. Tienor played the organ for weddings, funerals and daily Mass. She fondly recalls Sister Summer School. The Franciscan Sisters of Perpetual Adoration would visit for two weeks and teach daily catechism classes to the children of the parish. After graduating from high school in 1966, Tienor enrolled in a Catholic nursing school near Manitowoc. A bishop taught medical ethics and this served her well. Throughout her nursing career, she was given the option to step back from abortions or other procedures that went against her faith. “Thankfully, I never had to make that decision,” she exclaims. Attending year-round classes allowed her to graduate in three years as a registered nurse. Nurses were in great demand and she was hired right away. Manitowoc is also where she met her husband, Larry. In 1971, Sue was hired by Luther Hospital in Eau Claire and Larry continued his education at UW Stout in Menomonie. He then was hired by National Presto Industries as an engineer. They now had a place to call home. Together, as active parishioners, Larry and Sue raised three children in the Catholic faith. Everyone was involved. After more than 40 years, Tienor continues to be involved. She became part of an interaction group of 6-8 couples who would meet and talk about their faith. Later on, each group was given its own mission. Her group transformed into the Welcoming Committee. Tienor is one of the organizers for Finals Week Hospitality. Held in December and May, the group gives UW Eau Claire students free food and a quiet study place. This past December, 1,159 students were served meals. Home-cooked meals are offered to the students each month. It is the parish’s way of providing a homemade meal for students. Beginning with 12-25 students, it has multiplied over the years and now serves more than 200 students. Sue and Larry are part of the Fiesta Team—their month to cook is in February and they serve Mexican food. 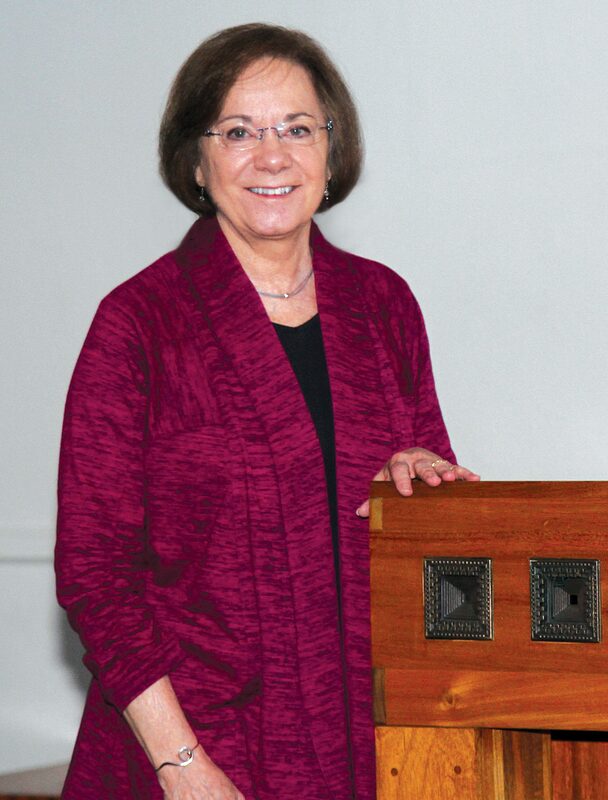 Sue embraces opportunities to volunteer to help parishioners and university students. In 2011, Tienor started helping out at the Free Clinic in Eau Claire. She works in the dispensary on Tuesdays and also is involved with the immunization program. “I pull up records from the Wisconsin registry for the doctors,” she says. She’s also been part of the local Women’s Giving Circle since 2010. She’s been co-chair and then chair of the organization, which is dedicated to developing educational programs to educate members and the public about the needs in the area. Grants are awarded to different organizations dedicated to helping women with different struggles in their lives. 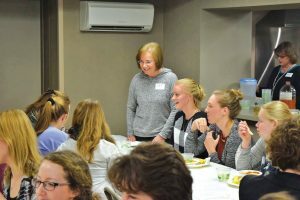 Sue visits with college students during one of the monthly student dinners. Her parish life includes being part of the pictorial directory team. She’s also been a member of the Parish Council on and off throughout the years. One of the goals of the parish is to keep all age levels involved. Young people today have different challenges. But they also have different choices. “We never allowed our family to be too busy with the family, social life or career to interfere with Mass. Today it’s more prevalent. Our upbringing plays a part in everything we do. Everything is tempered to where you’re at in your life,” Sue explains. When she’s not busy with her other activities, she likes to knit, crochet, paint and sew. She currently volunteers at Northwoods Elementary School in Eau Claire and teaches more than 40 children how to crochet. Sue Tienor may be retired, but she continues to make a difference—not only in her parish, but in her community.